Patented wireless guards technology Users don't need to worry about losing signals or slow performance in the wireless mouse. Patented Wireless Guard Setting Best Wireless Quality gamers can be assured to use it just like a wired mouse's performance! "Ahead" Technology reduces key response time to 1ms (normal time for others is 18ms). It significantly reduces the key response time and stay ahead of your enemies in game play! Unique 3-core system. It incorporates "Low, High, Ultra" 3 various levels for all game requirements. For instance, Core1 is suitable for Role Playing Games, Core 2 is suitable for FPS games and Core3 is suitable for senior FPS games. 3 shooting Modes in Left Button-Use "1, N, 3" keys to shift the left button with 3 shooting modes., e.g. "single shot, 2x shot, and 3-burst shot" to boost up the firepower for the best performance. 8 Programmable Buttons. 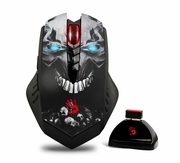 Perfect for playing FPS shooting games with 3 shooting modes in left button. Metal X'Glide Armor Boot is friction-less, durable and wear-resistant. The smooth surface enhancement glides 20% faster and last more than 300Km of traveled usage.